When the People’s Army 24th Regiment faded away that summer, major contacts became scarce in Kontum. Gen. Rosson began to focus elsewhere. Phu Yen province looked like trouble, so he sent the 173rd Airborne Brigade there, leaving behind just one battalion, Maj. James R. Steverton’s 2/503rd Airborne Infantry. It, too, left and was replaced by the 2nd Battalion, 8th Infantry (Mechanized). Kontum was hardly good mech country, though, and the 299th Engineers, responsible for the local roads, most importantly Route 14, had their hands full restoring the bridges blown up in guerrilla actions. So the grunts were mostly occupied in opening the roads. The most dangerous threats were ambushes, mines, and booby traps. The enemy seemed to have hunkered down in its base area across the border. The withdrawal of the airborne brigade would be fortuitous in one respect. The movement by C-130 aircraft took place over several days of rainy weather, which rutted the runway at Dak To’s airstrip. The engineers’ work to restore the strip turned out to be critical to its use when the North Vietnamese emerged from their bases. That happened in the latter half of October. According to a briefing given to Gen. Westmoreland early in December, it was at that time that the U.S. detected the North Vietnamese 1st Division in the tri-border area. Gen. Peers reacted quickly, flooding the hills with LRRP patrols, crisscrossing the sky with observation planes, employing chemical sensors (“Snoopy”) to detect bo doi urine and infrared (Red Haze) to find their campfires from the sky. Peers pulled his mechanized troops, substituting the foot sloggers of Lt. Col. John P. Vollmer’s 3rd Battalion, 12th Infantry. LRRP patrols reported that the North Vietnamese were indeed on the move, and toward Dak To. On October 29, Peers deployed the headquarters of 4th Division’s 1st Brigade to Dak To under Col. Richard H. Johnson. Along with it went Lt. Col. Glen D. Belnap’s 3rd Battalion, 8th Infantry. Col. Johnson put Vollmer’s battalion in a cordon south of Dak To and Belnap’s to the southwest. A battalion of the South Vietnamese 42nd Regiment held Dak To itself, and another was sprinkled around the area. There were Civilian Irregular Defense Group (CIDG) and Mobile Strike Force (Mike Force) companies at several Special Forces camps in the area, including Dak Seang, Plei Kleng, and Plei Krong. There was a planned CIDG camp at Ben Het, where Westmoreland wanted to install 175mm guns to shell enemy base camps across the border. Scout patrols indicated the enemy was on the move. Before dawn on November 2, a bo doi sergeant named Vu Hong surrendered to a U.S. patrol west of Ben Het. Hong said he was a member of a fifty-man reconnaissance unit scouting out potential firing positions for rockets and artillery. Hong proceeded to detail the locations of every element of the North Vietnamese 1st Division. His own 66th Regiment was on the march toward Ben Het. The 174th was moving toward there from the northwest. The 24th Regiment supposedly had hacked its way along jungle trails southwest toward Tan Canh, and the 32nd was approaching Dak To itself from the southwest. It was a lot for a sergeant to know. In any case, I Field Force took no chances. Gen. Rosson immediately began feeding the 173rd Airborne Brigade, the “Sky Soldiers,” back into Dak To piece by piece. First to arrive was Lt. Col. James H. Johnson’s 4th Battalion, 503rd Airborne Infantry, which went directly to Ben Het. MACV dubbed the new effort Operation MacArthur. Two companies of the 3/12 Infantry were pushing along Hill 1338, which loomed above Dak To, when Bravo Company first met the enemy on November 3. As much artillery as could be brought to bear, plus forty aircraft, plastered the position. The firefight occurred just two or three hundred meters from where a company of airborne troops nearly had been massacred in the June battle that touched off Operation Greeley. Col. Belnap’s 3/8 Infantry set up a firebase on the hill. The next morning his Alpha Company air-assaulted onto the next ridge. Before long, both battalions were engaged. At this point, Gen. Rosson ordered the remainder of the 173rd Brigade into the sector and gave Gen. Peers control of the operation. The 173rd was a big brigade, with four rifle battalions, but 3/503 had only recently been formed. Brig. Gen. Leo H. Schweiter left it behind for extra training and sweeps around Tuy Hoa. Schweiter moved quickly and had his men in position by November 6. That same day, the 4/503, already in position at Ben Het with orders to seek out the headquarters of the North Vietnamese 66th Regiment (supposedly nearby), put three of its companies on the line to dig out the enemy. They were also to establish a new firebase on Hill 823. The units were small—the largest rifle company had 125 men; the smallest, only 65—so platoons of CIDG strikers were added. The weakest, Capt. Thomas Baird’s Dog Company, ended up in a firefight against an entrenched enemy near the foot of Hill 823. The CIDGs ran away. Johnson pushed his companies hard, ordering the others to relieve Dog, where Capt. Baird, badly wounded, still led his men. Dog held out all night. The next morning the enemy was gone. Col. Johnson decided on a helicopter assault, flinging his last company onto the crest of the hill at the climax of this fight. U.S. tactical maps of the area contain the notation, “Generally Forest Covered.” This hardly does justice to the dense triple canopy in the area. There was no Landing Zone and the bombing did not clear one. 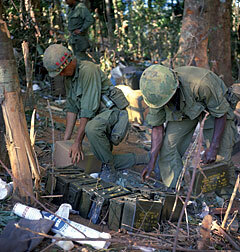 Johnson requested more and heavier bombing, and even that barely beat down the jungle growth. The company ended up in the middle of a North Vietnamese defense complex. The ensuing fight went through the night. There were heavy losses. Battalion commander Johnson wanted to go on, but Gen. Schweiter ordered all of 4/503 back to Ben Het for rest and replacements. Lt. Col. David J. Schumacher’s 1/503 replaced Johnson’s battalion and moved out to the west of Ben Het to “pursue” the enemy. It, too, had heavy contact. Capt. Thomas McElwain’s Charlie Company, paired with Capt. Abe Hardy’s Dog Company, were pressed so hard that they required rescue, too. Gen. Schweiter had to intervene with the battalion commander to get the relief force into action. The two-company force lost 20 dead, 154 wounded, and two missing. The relieving company suffered an additional 30 wounded. Capt. Hardy was killed, leaving Dog Company with just one officer standing, plus about 50 GIs. There were just 40 men left in Charlie Company. The Dak To airstrip was chaotic from a logistics standpoint. There had been a series of accidents over several months involving aircraft and ground vehicles, caused by vehicles forced to drive on the airstrip to stay out of the mud. In two accidents in September, C-130s collided with trucks. An accident in mid-October, when the ground vehicle was a bulldozer, resulted in the death of the dozer driver and the loss of the aircraft, which took off successfully but crashed on landing. The new battle brought an emergency lift to deliver a three-day supply reserve. Beginning on November 8, MACV allocated twenty C-130 flights per day to Dak To. Troop movements were on top of that requirement, leading to very heavy use of the airstrip. Emergency runway lights were installed for night flights. Brig. Gen. Hugh E. Wild of the 834th Air Division, the Seventh Air Force’s transport command, warned MACV to be prepared for the loss of aircraft if flights were continued. The warning was prophetic.